Once in a blue moon Dame Luck deigns to bestow her beatific smile on us. And when she does, bountiful blessings rain upon us. 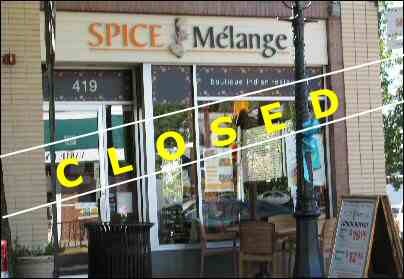 Like during our recent visit to Spice Melange on Main Street in Metuchen, NJ. Folks, Spice Melange is truly an embarras de richesse, an exception to the crappy Indian restaurants fouling up the New Jersey landscape, particularly in Edison and Iselin. We had noticed Spice Melange on the busy Main Street during our drives through Metuchen but never had a chance to drop anchor until the other day. As we tiptoed into the restaurant, we were a little taken aback to see it completely deserted save two employees (a Sikh chef and a Hindu (?) waiter) shooting the breeze in a corner. As they saw us, the turbaned Sikh ran away from us into the kitchen while the dark Hindu rushed toward us to show us to a table. Hungry as we were, we fell upon our food like lions after a wildebeest kill. Almost all of the food met with our approval. The hot and nice Tomato Soup soothed our inner chill while Brocolli Pakoras were spicy, crisp and tasty. We can’t recollect an Indian restaurant where the Pakoras wowed us. The medium thick Baingan Bartha was appropriately spiced and a nice treat with both Naan Bread and White Rice. Mutter Paneer was one of the so-so dishes we encountered. Although better than what we’re used to elsewhere, it was a bit sour to win our hearty approval. We don’t often encounter French Beans with Coconut at Indian restaurants in New Jersey. So we were pleasantly surprised to see it and happier still after tasting a spoon of this mildly spiced dish. Naan Bread was hot, soft (unlike the hard nonsense served elsewhere) and so good that we asked for a second basket. Tandoori Chicken was moist, well marinated and very flavorful. Sadly, Tandoori Chicken at most New Jersey Indian restaurants has become a dry, horrid travesty. How nice to savor the Spice Melange version. Chicken Makani in a thick creamy heavenly tomato sauce was so delicious that we surrendered ourselves to its spell. Gajar Halwa was a fitting finale to our meal. Hot and with a nice cardamom flavor, we were swept off by the divine taste and gobbled up a second cup. Our waiter was friendly, prompt in getting us the Naan Bread and removing the finished plates and obviously an asset to the place. Besides the Mutter Paneer, our other disappointment with the restaurant was to find it doesn’t serve Indian style Masala Chai. From the outside, it’s hard to guess the exact ingredients that go into the making of a fine Indian restaurant. A dedicated owner, talented chefs, warm waitstaff and happy employees are obviously sine quibus non. Seems like Spice Melange is blessed with all of them. As we walked out into the November chill, we couldn’t but help look up and throw a prayer to the sky for our good luck. SearchIndia.com strongly recommends Spice Melange.